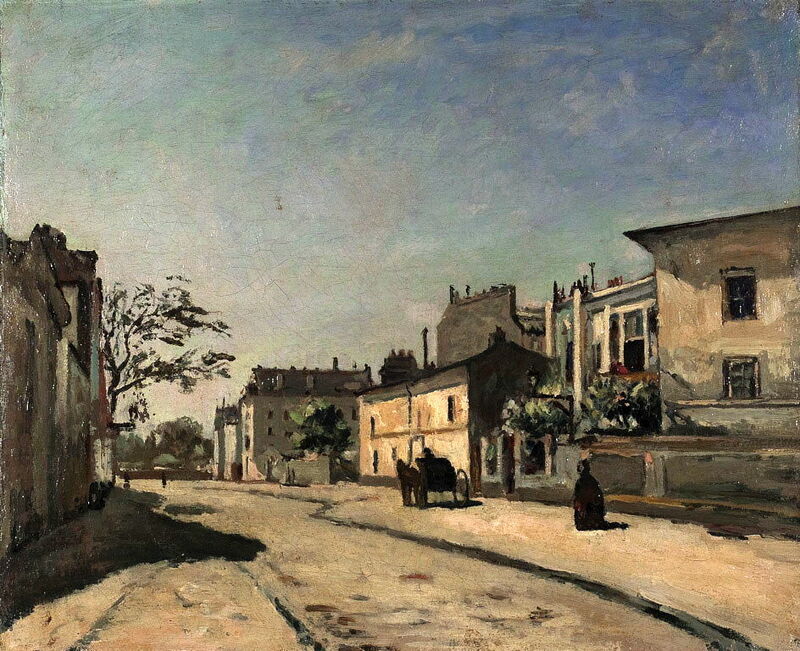 Édouard Béliard (1832-1912), Boulevard de Fossés in Pontoise (1872-3), media and dimensions not known, location not known. Photo by postlucemtenebrae, via Wikimedia Commons. Several of those whose work was shown at the First Impressionist Exhibition in April 1874 have almost vanished into the past. Here are three, whose dates of birth and death are not even certain. Next to Émile Zola, Astruc was probably the most influential of the associates of the Impressionists at the time of their first exhibition. A talented writer and poet, over the period 1859-1872 he was a respected critic and commentator on the arts, who wrote for several important newspapers and magazines. Henri Fantin-Latour (1836–1904), A Studio at Les Batignolles (1870), oil on canvas, 204 x 273 cm, Musée d’Orsay, Paris. Standing (L to R) are Otto Schölderer, Pierre-Auguste Renoir, Émile Zola, Edmond Maître, Frédéric Bazille, Claude Monet. 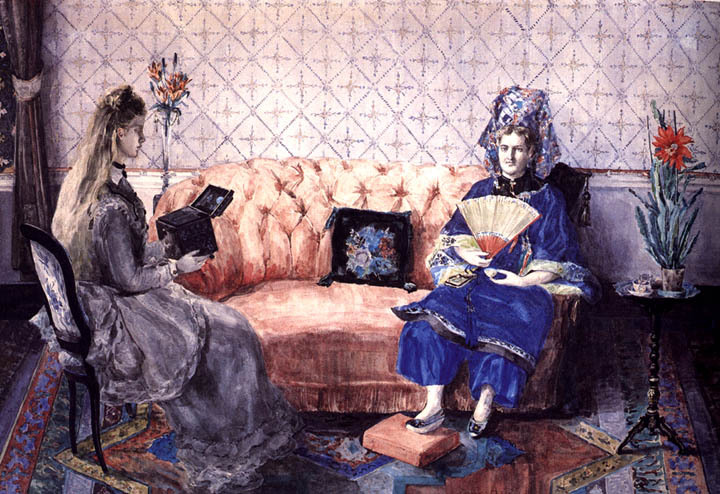 Seated are Édouard Manet (L) and Zacharie Astruc (R). He was a staunch defender of Courbet and the avant garde, promoted the work of El Greco in France, and was more generally an expert on and enthusiast for all things Spanish. He became a close friend of Manet, and appears in several major pre-Impressionist paintings. Manet painting his portrait (1866), and included him in his Music in the Tuileries (1862), and Music Lesson (1870). 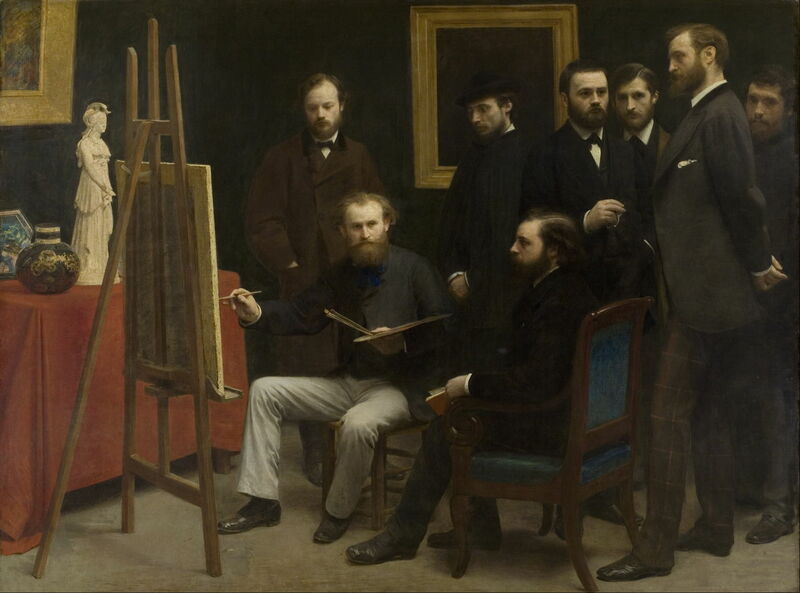 Fantin-Latour placed him, seated on Manet’s left, in his A Studio at Les Batignolles (1870), above. The august young woman in whom ardor is ever wakeful. Zacharie Astruc (1835–1907), The Chinese Gifts (London) (before 1874), ?watercolour, dimensions not known, Private collection. By Rlbberlin, via Wikimedia Commons. Astruc was an early enthusiast for Asian art, and is considered to be one of the driving forces behind Japonisme, writing series of articles about the art of Japan from 1866. When he turned to sculpture and watercolour painting from about 1870, he concentrated on floral still lifes. Among the six paintings which he showed at the First Impressionist Exhibition is believed to have been The Chinese Gifts (London) (before 1874), shown above, and may have included Landscape with Wagon and Haystacks (c 1869–70), below. 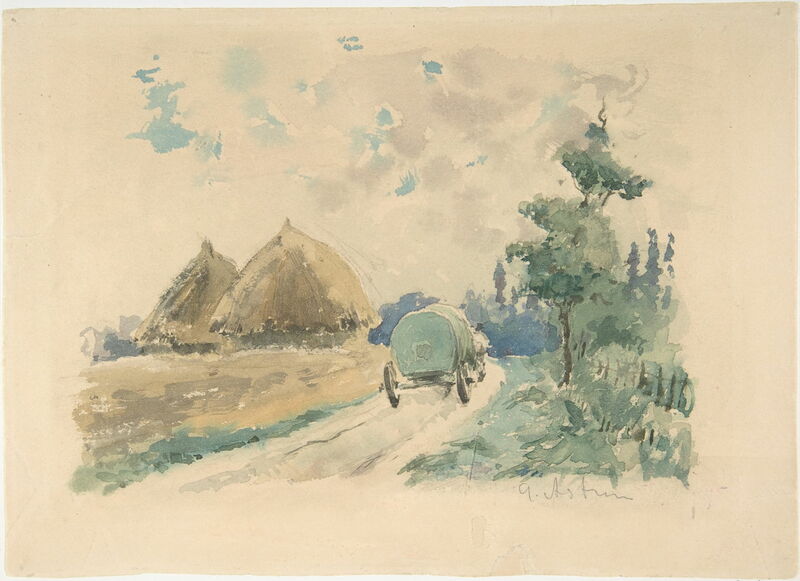 Zacharie Astruc (1835-1907), Landscape with Wagon and Haystacks (c 1869–70), watercolour on paper, 13.6 x 16.9 cm, The Metropolitan Museum of Art, New York, NY. Photo courtesy of The Metropolitan Museum of Art, Gift of Gregoire Tarnopol, 1971, at http://www.metmuseum.org. Although he continued to paint, in later years his sculptures were better-known. He made a head of Manet in 1881 which was mounted on his grave, and the elaborate bronze The Seller of Masks (1883), now in the Luxembourg Gardens in Paris. He was awarded the Legion of Honour in 1898, and a bronze medal at the Exposition Universelle in Paris in 1900. 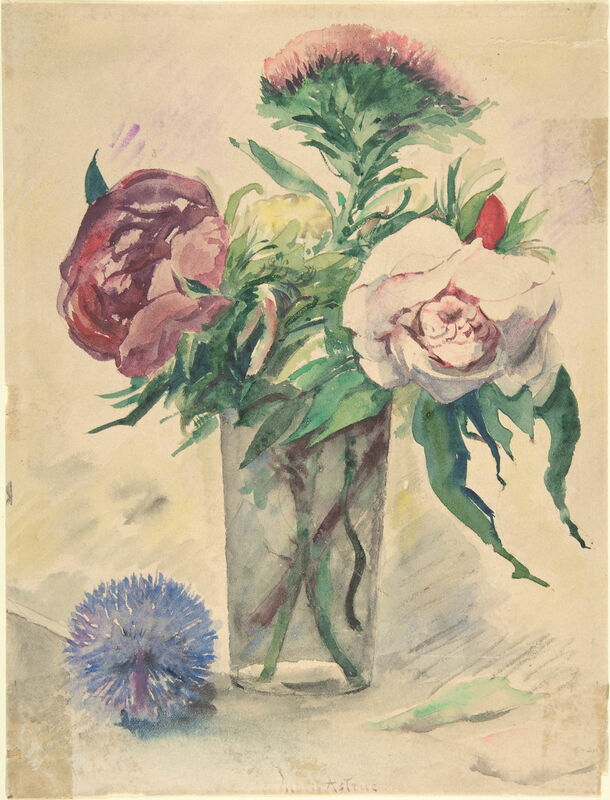 Zacharie Astruc (1835-1907), Flowers in a Vase (c 1884–1904), watercolor over traces of graphite on paper, 23.4 x 17.1 cm, The Metropolitan Museum of Art, New York, NY. Photo courtesy of The Metropolitan Museum of Art, Gift of Gregoire Tarnopol, 1971, at http://www.metmuseum.org. 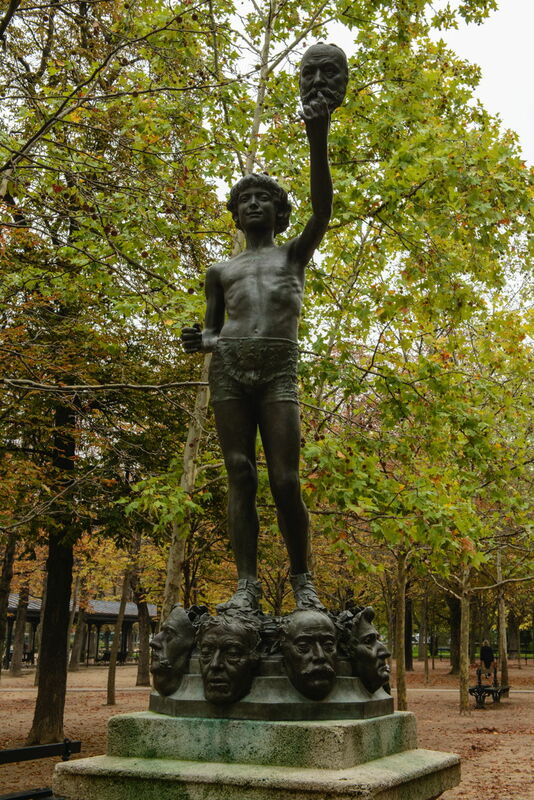 Zacharie Astruc (1835–1907), The Seller of Masks (1883), bronze, 200 × 69 × 78 cm, Jardin du Luxembourg, Paris. Wikimedia Commons. Masks shown at its foot are: Corot, Dumas, Berlioz, Carpeaux, Faure, Delacroix, Balzac, Barbey d’Aurevilly. In the right hand is the mask of Victor Hugo. Three other masks which were originally attached have since disappeared; those were of Gambetta, Gounod and Théodore de Banville. Very little is now known about Attendu, who showed six paintings in the First Impressionist Exhibition. He was apparently a pupil of Louis Mettling, and went on to paint mainly still life and landscapes. He worked in Paris and Neuilly-sur-Seine, and was successful in his submissions to the Salon in 1870 and 1898. 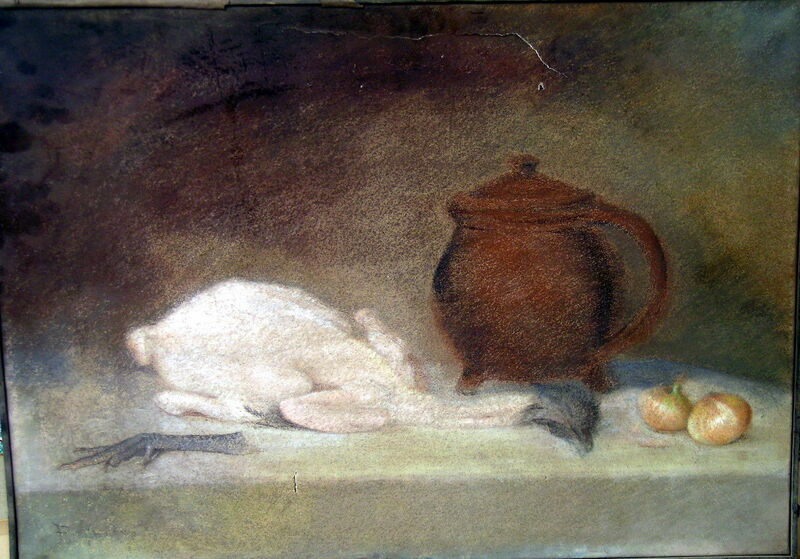 Antoine-Ferdinand Attendu (1845-1908), Still Life with Chicken (before 1888), pastel, dimensions not known, Musée du Château de Lunéville, France. Photo by MuséeLuné (musée du château de Lunéville CG54), via Wikimedia Commons. 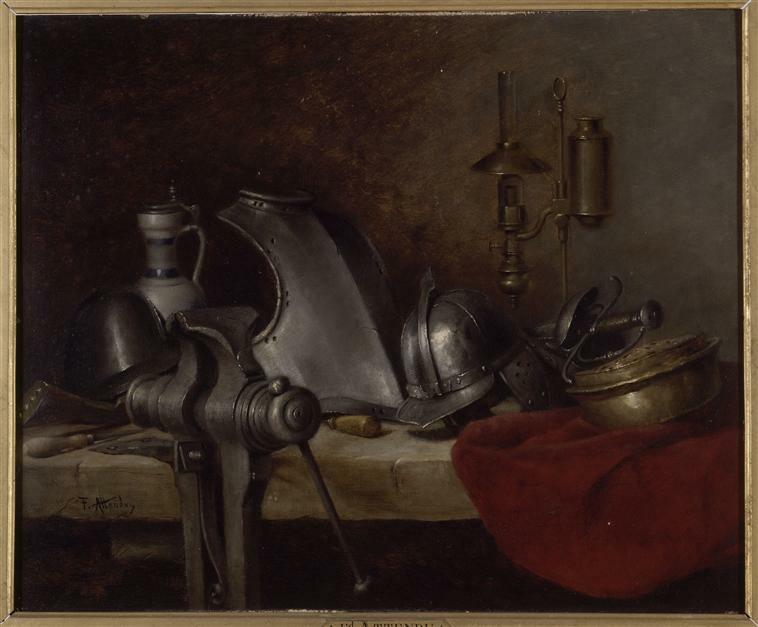 Antoine-Ferdinand Attendu (1845-1908), Still Life with Armour (date not known), media and dimensions not known, Museum of Fine Arts of Rennes. Photo © MBA, Rennes, Dist. RMN-Grand Palais / Patrick Merret. He appears to have remained a conventional realist throughout his career, and the few landscapes which he painted do not appear particularly distinctive, or in the least bit Impressionist. His paintings occasionally come up for auction today, but are not highly valued. The son of an architect, he was a pupil of Hébert, Bonnat and Corot. He first seems to have met Pissarro when he was at the Académie Suisse in 1860, following which they remained close friends. Like Pissarro, during the Franco-Prussian War of 1870, troops destroyed many of his earlier works, although Béliard remained in France during that war. During the summer of 1872, he painted in company with Pissarro, Cézanne, and Guillaumin in the vicinity of Pontoise, and was friends with Émile Zola, the writer and critic. 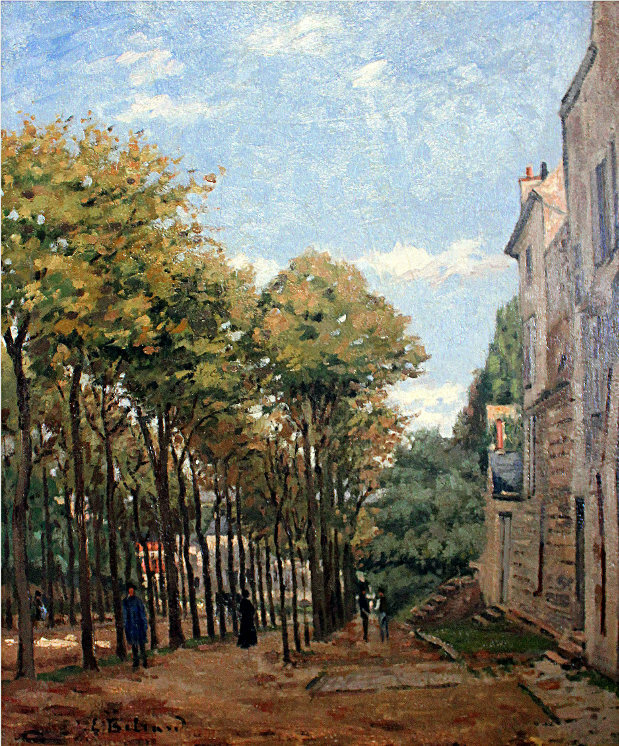 He showed four of his paintings at the First Impressionist Exhibition in 1874, probably including his fine Boulevard de Fossés in Pontoise (1872-3). He showed eight landscapes (of which five depicted Pontoise) at the Second Impressionist Exhibition in 1876, where Zola was quite complimentary of them. However, following the dissolution of the original Impressionists’ company, he joined l’Union, which was modelled more on a trades union, and was set up in 1875 by Alfred Meyer with Pissarro a major force. That group also included Cézanne, Guillaumin, and Latouche. 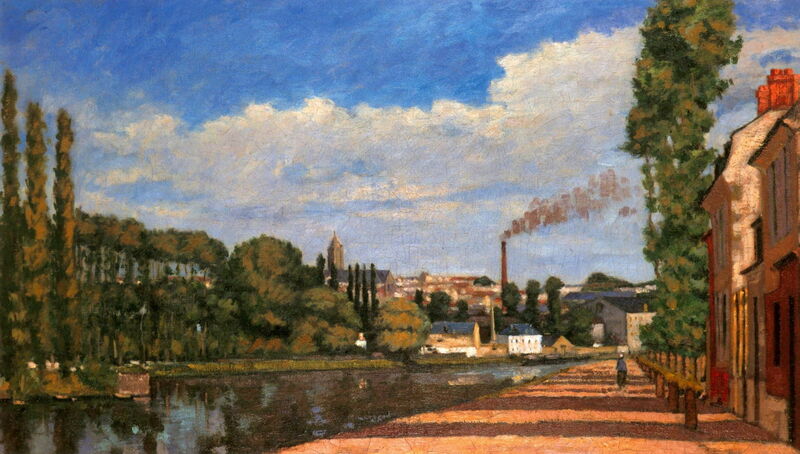 Édouard Béliard (1832-1912), Pontoise, View of the Lock (1872-5), oil on canvas, 38 x 65 cm, Musée Camille Pissarro, Pontoise, France. Photo by postlucemtenebrae, via Wikimedia Commons. Pontoise, View of the Lock (1872-5) is believed to have been among his paintings shown in that second exhibition. Its composition is reminiscent of Sisley’s The Canal Saint-Martin, Paris (1872), and its style is similar to those of Pissarro and Sisley at that time. 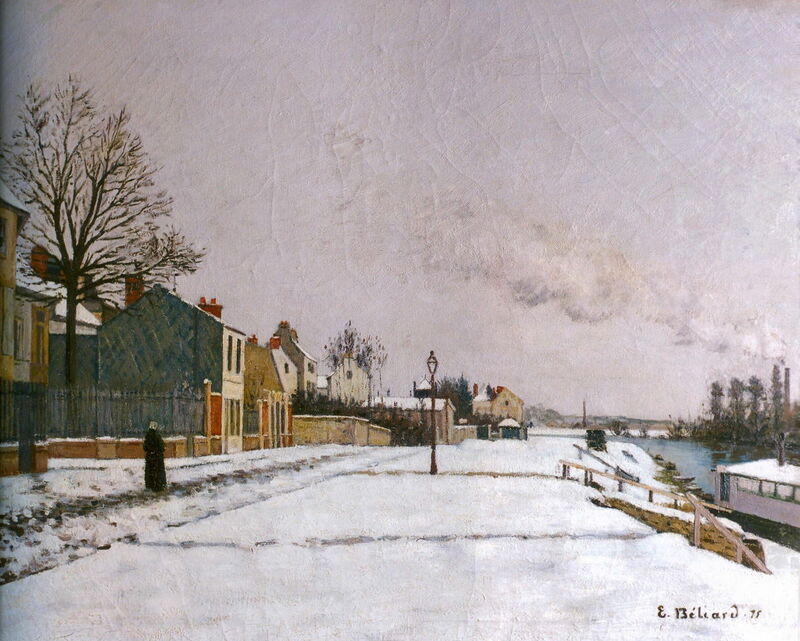 Édouard Béliard (1832-1912), Pothuis Quay in Pontoise, Effect of Snow (1875), oil on canvas, 72 x 91 cm, Musée d’Étampes, Étampes, France. Photo by postlucemtenebrae, via Wikimedia Commons. 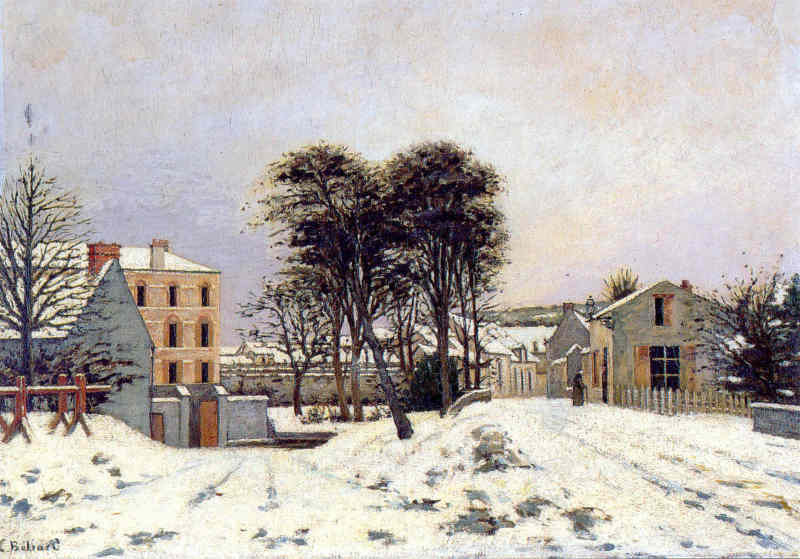 Pothuis Quay in Pontoise, Effect of Snow (1875) was also probably shown in 1876, and is similar in subject and style to the winter scenes painted around Louveciennes by Pissarro and Sisley from 1870 onwards. Édouard Béliard (1832-1912), Moulin de Chauffour, Effect of Snow (1878), oil on canvas, dimensions not known, Musée d’Étampes, Étampes, France. Photo by corpusetampois, via Wikimedia Commons. Moulin de Chauffour, Effect of Snow (1878) is another winter scene from the area near to Pontoise, although it is rather less loose than similar paintings of the mainstream Impressionists at that time. Édouard Béliard (1832-1912), Street Scene (date not known), media and dimensions not known, location not known. Photo by postlucemtenebrae, via Wikimedia Commons. This rather anonynous Street Scene, which is undated, is recognisably early impressionist in its motif, composition, and style. He dropped out of the third Impressionist Exhibition in 1877, and moved into local politics, becoming the Mayor of his home town Étampes for the period 1892-1900. His last paintings appear to have dated from about 1880-2. Posted in General, Painting and tagged Astruc, Attendu, Béliard, Cézanne, exhibition, Fantin-Latour, Guillaumin, Impressionism, japonisme, Manet, painting, Pissarro, Sisley, unknown, vanished. Bookmark the permalink.